FTLOG | What Does FTLOG Mean? FTLOG, can't you do anyhting right? FTLOG! Please stop sending those tweets! There are many similar phrases which avoid religious references; e.g., "For Pete's Sake" or "For Pity's Sake". 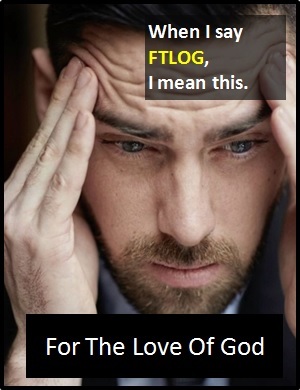 FTLOG is used to show exasperation, anger or frustration. Adam: A guy walks into a bar with a roll of tarmac under his arm and says: "Pint for me and one for the road". Billy: FTLOG! When will you realise your jokes just aren't funny? Charity: Really sorry, but I can't give you a lift tonight. Shannon: FTLOG! Will you ever keep a promise? FTLOG, how did he end up in there?